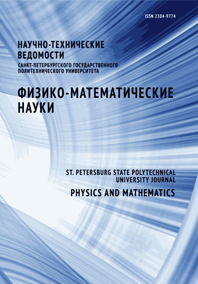 Tregulov Vadim V. Stepanov Vladimir A. Melnik Nikolay N.
The possibility of formation of a p–n-junction in a film of porous silicon by means of pulse laser radiation have been shown. Methods of Raman spectroscopy and photoluminescence spectroscopy were used to investigate features of transformation of a microstructure of a film of porous silicon under the influence of laser radiation. It was established that influence of a single laser impulse lasting 18 ns with the wavelength of 355 nanometers and energy of an impulse in the range of 85 – 200 mJ lead to disappearance of an amorphized phase and an increase in the sizes of crystallites in a film of porous silicon. In the paper it was shown that the p–n-junction was formed under the influence of laser radiation inside the largest silicon crystallites of a porous silicon film. To study the features of the electrophysical characteristics of the obtained semiconductor structure, methods for measuring the current-voltage and the capacitance-voltage characteristics were used. The obtained p–n-junction was sharp. The mechanisms of current flow had a complex character and were mainly determined by the processes of generation and recombination of carriers in the space-charge region of the p–n-junction involving the energy levels of the traps.